When you visit other gardens in other cities, you can take away something that is even better than a passalong plant. You can take home ideas for your own garden. But ideas? Ideas are easy to pack, won’t cause a raised eyebrow in airport security, and don’t have to be planted as soon as you get home. But once used in your own garden, ideas can remind you of the gardener who gave them to you, just as much as a plant can. While in Austin for the Garden Bloggers Spring Fling, I gathered pages of ideas from many gardens and gardeners and brought them back to my Indiana garden. Some of them I will act upon quickly, others will be there, waiting in my notes, for their time. 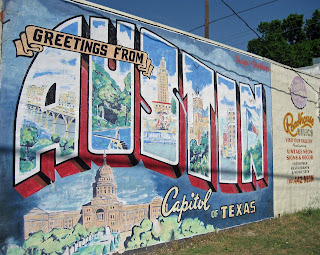 My first idea came from Annie in Austin, who told me the secret about her secret garden. But I swore not to reveal it. I can, however, reveal the secret of how she makes her garden seem bigger. Paraphrasing Henry Mitchell, Annie said, “Double the space by dividing it”. Her garden is divided into little vignettes, beautifully planted with the flowers that most appeal to her. 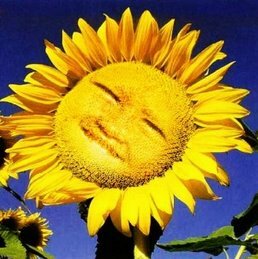 And because she knows and loves each flower in her garden of vignettes, her garden feels like a garden ought to feel, like there is a gardener there who tends it and cares for it, and knows it. 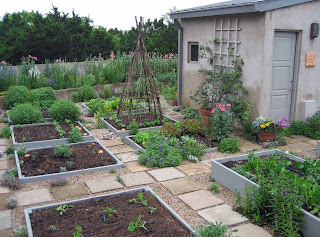 As I look at my garden, on its suburban lot, I think I’ll use Annie's idea to plant some vignettes, to divide the space more, to give the garden a larger feel but at the same time provide smaller spaces to really know and love in the garden. Pam/Digging opened up her garden and home for a social hour with all the bloggers. I could look in any direction in her garden and see many ideas to bring back to my own garden. Pam might just be starting a container revolution in the garden industry by using stock tanks of different sizes as planters. Stock tanks are perfect for water gardens, since they are designed to hold water. Or as shown here sunk down into the garden at Pam's, they can frame a speciman plant. And if you drill holes in them for drainage, before you plant them up, you can also use them to create beautiful miniature landscapes, bringing the plants and flowers more to eye-level. I’m thinking of where I can put a stock tank planter in my garden now. I’ve used a small metal wash tub as a planter for several years, but that’s just not the same. And burying a stock tank might be the perfect way to have some mint, and still maintain a garden. MSS at Zanthan Gardens seems to have figured out, over many seasons, that her garden will have its days of delight and she’s worked to plant annuals that will make those days as delightful as she can. I was fortunate that some of the most delightful days occurred in early April when I was there. She’s overcome challenges of soil and shade, and plans that didn’t work out, to create an oasis in Austin where visitors can relax amongst spiderworts, cilantro, and larkspurs blooming under a light shade from new leaves on the trees. She welcomed many of the bloggers to stop by and relax. In Melissa’s garden, I am reminded that sometimes gardening is about making choices and that sometimes just watching and waiting and seeing what the garden wants to become is a choice, too. I'll spend some time watching and waiting in my garden. I’ve got other ideas, too, from visiting other gardens in and around Austin. I want to paint my black compost tumbler so that it blends in more with the surroundings. I think a tan/light brown would make it less obvious where it is beside the privacy fence in my raised bed vegetable garden. This idea came from the garden of Jenny Stocker, who was also one of our guides at the Lady Bird Johnson Wildflower Center. Don’t look for a carefully camouflaged barrel in this picture. It’s behind that shed in her vegetable garden and I didn’t think to take a picture of it. 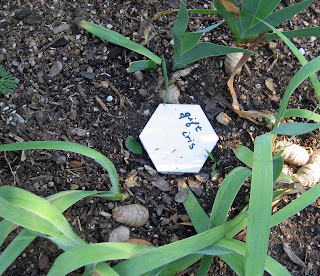 MSS uses old tiles as place markers in her garden. I like that idea, as the tiles aren’t really visible until you are right up on the plant. I’ll have to ask her what kind of pen she uses on them. 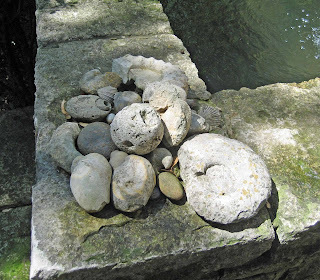 A little pile of unusual found rocks adds interest to a garden area, if put where people can see them. I have a bowl on my coffee table at home filled with some found rocks from my garden. Now I think I’ll look for a place around my patio to group some of the more unusual objects and rocks found while digging in the garden, as each of them tells a story about the garden, too. This idea came from the garden of landscape architect James David, which we toured on Saturday afternoon. I’m sure there will be more ideas that will come to me in an odd moment here and there as I tend my garden, look back on pictures of the Garden Bloggers Spring Fling, and read the many posts that will be written about it. Some of the ideas I’ll recognize as “seedlings” from this trip; other ideas will just come to me and I’ll wonder where the thought came from, just like I wonder sometimes where a new plant came from that just shows up in my garden. None of these ideas are revolutionary and many are not new, even to my own garden. But now that I can connect them to a place and time, to a garden and gardener, they will make my own garden feel more connected to gardens and gardeners across the country and around the world. 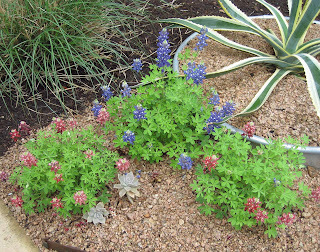 I am lacking in pictures to go with most of these new ideas that I brought home with me so I encourage you to visit the blogs linked above of these wonderful Austin gardeners, who gave me ideas to bring back to my Indiana garden and were so welcoming to all of us bloggers this past weekend. Beautifully written, Carol. You have captured what many of us came back home carrying in our minds of the visions of the Austin gardeners. Pam's stock tanks are indeed a great idea, but I also liked her use of cheap metal chimney liners as planters (next to the driveway). People often use clay chimney liners as pots, but they are expensive. After pricing out a cluster of them, I gave up the idea with a sigh. Please post on the conversation you all had in Pam's living room about the social aspects of blogging. Beautifully written, Carol. Whenever I visit a garden, I come home with an idea or two in my head too. I'm glad to know that a few passalong ideas from Austin may eventually become reality in your Indiana garden. And Karen, that metal chimney liner is so inexpensive and easy to do. To get it to stand up without falling over, tall and skinny as it is, I stuck 3 long lengths of rebar in the ground along the inside circumference of the pipe, then set the pipe over them. If it tries to lean, the rebar will hold it upright, I hope. I filled the base of the pipe with gravel for extra stability and drainage, then topped it off with about a foot of soil for that little agave I planted in it. I'm just imagining what it would be like to tour gardens that have so many good ideas! I'm loving all the insight/comment/photos from Spring Flingers...thank you! Those are great ideas, Carol. I've been thinking about Pam's stock containers for a while now, I'd love to implement them in my yard. You came home to some lovely weather. Do you think spring is here to stay now? Carol, thanks for sharing and in so taking us along for the ride. Lovey gardens tended by lovely gardeners. What a treat! Part of the experience of visiting others' gardens is getting new ideas, and it sounds as though you have many. Carol you have expressed so well what I have found to be true. I love to visit other gardens. If nothing else I always find a way to look at my garden different. So many good ideas here. I never would have thought to set a pile of rocks in the garden as a point of interest. I've been having fun checking all the "flingers" blogs today. And I thought the lesson you were going to learn from my garden was, "Be very careful when hiring landscape architects to build a major project in your back yard." The hexagonal tiles are from our 2006 kitchen remodel. We tried to reuse or recycle as much of the material as we could. I use a special paint marker (for painting decorative tiles) that I bought at the craft store. The brand is "DecoColor" but there are others. The ink from ordinary markers does not stick well to the tile. 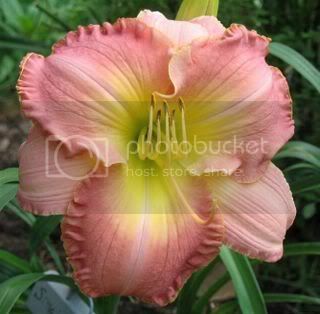 So many great ideas, I can't wait to see trasformations in your garden as you incorporate them. Carol - I'm still processing all the gardens I saw, and my mind is going a mile a minute! I think the most important thing I learned garden-wise was about dividing up the garden into intimate spaces. I really liked how all the gardens I saw encouraged wandering to explore what was around the bend and also sitting and smelling the roses, so to speak, while also providing the opportunity to try out different color schemes and "feels." I'm trying to figure out how to apply that concept to my front yard re-do. And yes, I too had a hard time not saying thank you for the passalongs I received, especially on Sunday when Annie sent me home with three kinds of iris! You know, you're exactly like what I expected from reading your blog? Your gentle nature and sense of fun really come through in your writing--and in the way you talk. And I truly appreciate your not holding it against me about the dog/tree comment. As for how the girls are doing, I have no idea. I'm still stuck in San Francisco, but will see them tomorrow night. Did I tell you I hire a dog nanny when I travel? You don't need a tree nanny, do you? And another inspiring post from you, Carol! It's also fun to see what other bloggers find in meeting their blogging pals for real. If we're all spared, God willing, and the Austin gang do this next year...I'm going to get there. But I'm driving. Any idea how much an airline could mess up getting a Nova Scotian to Texas? Carol: This was a wonderful way to highlight and thank each of those gardeners who opened their garden to the group. I have always thought is difficult to convey the 'terroir' of a garden in tight shots and often the larger views don't capture the essence. Your words brought life to each of these special places. Now I know what surprised you and delighted you on the tour! Thanks! Jodi, in answer to your comment above, the Austin bloggers who planned the Fling are in agreement that next year---and there should definitely be a next year---the event should move to another city. I'd love to see a group of bloggers (it doesn't take more than 3 or 4) step forward and say they'll host next year. I'd be happy to pass along what we learned in hosting this year. You have such a talent for writing, Carol. I'm glad you found some ideas worth taking back from Austin. It was a pleasure to meet you. I loved that pile-o-fossils at the David/Peese Garden, too. It reminds me of what Tom Spencer said about sacred collections. I had wanted to read about the Austin event...thanks for sharing and for reminding me it's time read the reports! It's great fun and inspiring to visit other gardens...the best ones linger in your mind and sow the seeds for change and/or new ideas. I have the smallest (I think...the back porch one or whatever they call it) compost tumbler that I've had for a number of years. It sits on a frame and I do like the idea that it is green...nice that I didn't have to paint it...just wish I had some level spot I could actually put it (right now, it is sitting on part of the deck...not a good idea). It makes pretty good compost, though not as rapidly as they say. This year, I had enough to give all my backyard roses some!